Benefit Cosmetics - Free Mascara Sample! Home » Health & Beauty » Benefit Cosmetics – Free Mascara Sample! 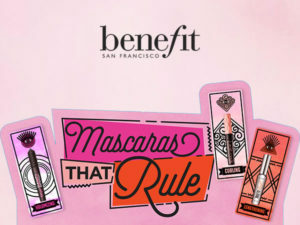 Click the link below and fill out the form to see if you qualify to receive a fun size mascara of your choice from Benefit Cosmetics. You must follow @BenefitCanada on Instagram to be eligible for this sample (you also need to provide your Instagram handle in the form).